Home > What is Conveyancing? > What Will a Conveyancer Do For Me? Saving money on conveyancing fees by doing it yourself is an attractive prospect. For those with the time and patience to do it, DIY conveyancing can be an ideal way to save on some of the costs of a sale. However, for some people, hiring a licensed conveyancer or solicitor may still make sense - especially if the buyer or seller does not have much time to devote to the conveyancing or if the sale is not straightforward. Particular care should be taken with purchases involving new-build properties or leaseholds. Below are some of the potential advantages of engaging a professional conveyancer. Land law is complex and there are often several factors which, whilst crucial to a valid transaction, would not necessarily occur to a non-legally qualified person. Conveyancing solicitors or licensed conveyancers should be able to provide their clients with expert advice on a wide range of areas including mortgage finance, joint ownership of property and the meaning and likely consequences of the property survey. Corresponding, liaising and negotiating with the other side are all important aspects of conveyancing. As soon as an offer has been accepted on a property the conveyancer acting for the buyer will start asking the seller’s conveyancer a series of questions relating to the property itself and the land around it. Conveyancers should know all the right questions to ask and the answers to these questions may be crucial to the final contract agreed between the parties. Negotiating can be stressful and not everyone is good at it. Some people may find that having a third party, like a conveyancing solicitor, to do the negotiating helps them to protect their position and avoid being browbeaten by the other side. Conveyancers carry out searches at the local authority which should reveal whether there are any restrictions on the way in which the property, or the land it is on, can be used. These searches should also give notice of whether any developments or construction are planned for the area. Conveyancers will also carry out searches of the information held by the Land Registry about the property being sold. Whilst these entries are accessible to the public, for a £3 fee, a professional conveyancer may be more attuned to the possible implications of any notices, charges or restrictions registered against the property. The seller’s conveyancer will prepare an initial draft contract which will then be sent to the buyer’s conveyancer for their consideration. Many contracts for the sale of land are standard documents, copies of which could be obtained by a lay person doing their own conveyancing. However, qualified conveyancers will inevitably have a better idea of what is required for a particular sale and what to look out for before the final version of the contract is agreed. 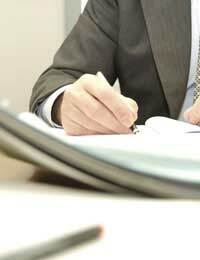 Conveyancing solicitors and licensed solicitors are able to give binding and enforceable undertakings that a particular thing will be done. This can often save time and be a more efficient way of completing a sale. For example, contracts for sale of land are now often exchanged over the telephone. Instead of either having to exchange contracts in person or waiting for a contract to be received in the post, the conveyancers simply agree that contracts have exchanged. The conveyancer acting for the buyer and for the seller will both give undertakings that the practical steps required for exchange of contracts will then follow. A non-legally qualified person is not able to give undertakings of this kind. What happens to any deposit payable by the buyer upon exchange of contracts is an important issue. If the deposit is paid directly to the seller, and they subsequently pull out of the sale, the buyer may find it difficult to get their deposit back. If the parties have conveyancing solicitors acting for them, the seller’s conveyancer should be required to hold the deposit until the sale completes. Stamp Duty Land Tax (SDLT) currently has to be paid by buyers on most residential sales. An SDLT return will probably have to be sent to HM Revenue and Customs following the sale even if the price paid falls below the Stamp Duty threshold. The SDLT return and any payment due must be sent to HM Revenue and Customs within 30 days of the sale. Penalties are generally payable on late returns or payments. Where a buyer has a conveyancer acting for them complying with the SDLT requirements, and advising on any exemptions, would usually be part of the service they provide.